Magenta and white-flowered rose campion, Lychnis coronaria. Rose campion is one of about 20 species of perennials and biennials in the genus Lychnis. This group in the pink family (Caryophyllaceae) is closely related to – and is sometimes included in – the genus Silene. The genus Lychnis, from the northern temperate zone, is quite variable, but all species have vividly-colored flowers. The genus name, used by Theophrastus from the Greek work lychnos which means “lamp”, is thought to refer to the use of the woolly leaves as lamp wicks in ancient times. The common name of rose campion supposedly comes from the use of its flowers to make garlands for athletic champions. L. cornonaria (also known by the synonyms Agrostemma coronaria, Coronaria coriacea and Silene coronaria) has small but showy, deep pink to fuchsia to magenta or white blossoms. It is a short-lived perennial or biennial from southeastern Europe hardy in zones 4-10. Most plants do not survive harsh winters after flowering, but it does readily self seed to perpetuate a planting. Despite its short life span, rose campion is certainly worth growing. The leaves of rose campion are covered with fine hairs for a fuzzy appearance. Sometimes called Dusty Miller for the soft, silvery-gray, velvet-like foliage (one of several completely different plants known by this common name), it forms Verbascum-like rosettes of leaves the first year and spreading mounds 2-3 feet tall in subsequent years. 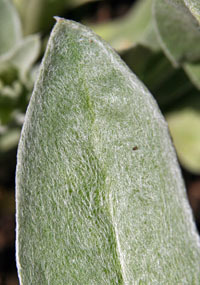 The greenish-grey-white stems and leaves are densely covered with silver-grey hairs, giving a fuzzy appearance. The opposite, lance-shaped leaves may be as long at 3” but are usually shorter. 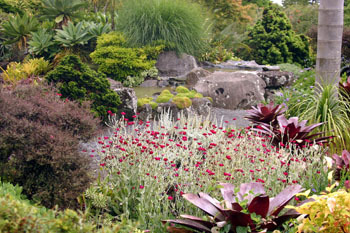 Plants remain evergreen in mild climates. This plant has a strong upright habit (even leggy in rich soils) when it begins to flower. A profusion of flowers up to 1” across are produced in summer. The simple 5-petaled flowers occur in small heads (terminal cymes) held well clear of the foliage. The petals are typically in vivid shades of pink or hot magenta that contrast nicely with the silvery foliage. Rose campion combines well with many other plants. 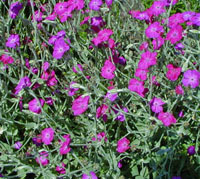 Rose campion combines nicely with pink, lilac, purple, and blue flowers and contrasts well with bright yellow flowers. It can also be paired with other magenta flowers such as winecups (Callirhoe involucrata) or phlox. The silver foliage helps tone down the intense flower color, and provides good contrast to dark green or purple-foliaged plants and variegated leaves. Use it with bright orange and yellow in a “hot” garden, or mix with pastels for a cooler effect. Try mixing it with petunias and Vinca minor as an annual planting. It can be planted around bulbs to hide the yellowing foliage. A single plant can perk up a border, while a group or mass of plants will provide a swath of subtle color. The silver foliage in early spring. 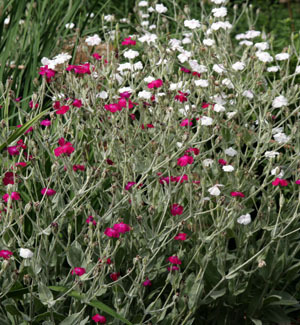 As with many silver-foliaged plants, rose campion prefers fairly dry, well-drained conditions in full sun or partial shade, but will tolerate clay and moist soil. Deadhead regularly to encourage continuous flowering or shear after the initial flowering to promote a second flush of flowers later in the season. Removing the dead or faded flowers may also help overwintering. This plant has few insect or disease problems, and is not bothered by deer. Rose campion adds a splash of bright color. Rose campion is easiest to propagate from seed. It produces copious amounts of seed and will readily self-seed. 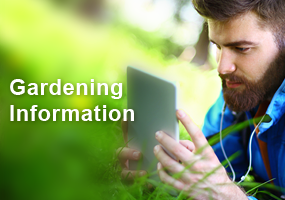 To encourage self-seeding, don’t mulch around the plants. Leave the ground undisturbed around dead plants and seedlings will appear in spring. 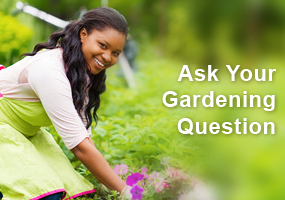 Thin the seedlings or transplant to other areas in late spring when large enough to handle. Space plants about 12-15” apart. 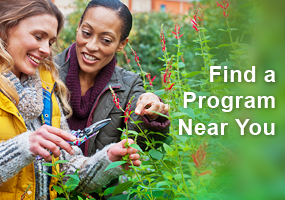 The distinctive seedlings are easy to identify and easy to pull out if you don’t want them. Basal cuttings can also be taken in late spring. A white L. coronaria flower. ‘Abbotsford Rose’ has rose-colored flowers. ‘Alba’ has white flowers and a weaker growth habit. ‘Angel Blush’ has white flowers with a pink blush. ‘Atrosanguinea’ has very light foliage and deep magenta flowers. ‘Dancing Ladies’ is a mixture of white and carmine, usually with a darker eye. ‘Flora Plena’ has double flowers. ‘Oculata’ has white flowers with a pink or red eye. It requires maintenance!! (TRIMMING, PULLING, ETC). IF NOT, IT WILL COME UP EVERYWHERE…IN MY GRAVEL DRIVEWAY, UNDER TREES, VERY INVASIVE UNDER RHODODENDRONS, EVEN IN THE LAWN. SO BEWARE BEFORE PLANTING THESE SEEDS! I REGRET IT BIG TIME! That only happens if you let it go to seed. It is self-propagating. If you don’t want it to spread via seed, cut the stems back once the flowers are spent. They don’t spread via root system so they’re not invasive in that sense. 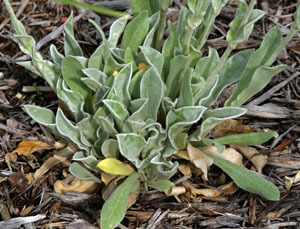 The plant is sometimes called Dusty Miller for the soft, silvery-gray, velvet-like foliage. The plant has strong upright when it begins to flower. The plant self seeds readily and my gardens are full of it. 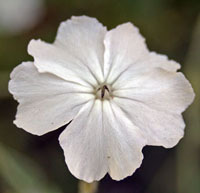 The simple 5 petaled flowers occur in small heads held well clear of the foliage. As with many silver-foliaged plants it prefer fairly dry, well drained conditions in full sun or partial shade. Removing the dead or faded flowers may also help over wintering. Not the same as dusty miller, but same silvery-gray, velvety foliage. Completely different leaf. My friends call it lambs tongue. The leaves are similar in that both are silver and fuzzy. They are very different plants. Isn’t this also called “Wall flower”? A friend of mine who is in her 90’s says that is the name her mother called it. Hers is a lighter pink than mine, which is a very deep magenta. I dig it out by the barrel full every year. It readily self seeds.